With the melting of the icebergs on the beach has come the early-season agate hunters. Mike Miller makes a return to the web page with his friend, Terry House -- both from the Muskegon/Fruitport area. 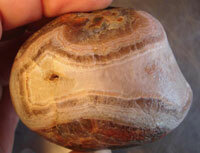 Terry House found this nearly half-pound nodular agate with well defined banding around a quartz center fill. 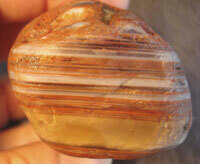 Mike Miller found two nice agates. The first is a small but beautiful agate with a carnelian center. 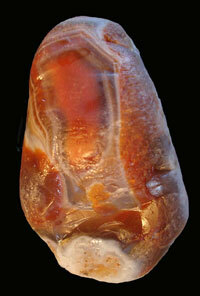 The second is an absolutely amazing water level agate that is around a third of a pound. These agates and more were found east of Grand Marais. Congratulations Terry and Mike!